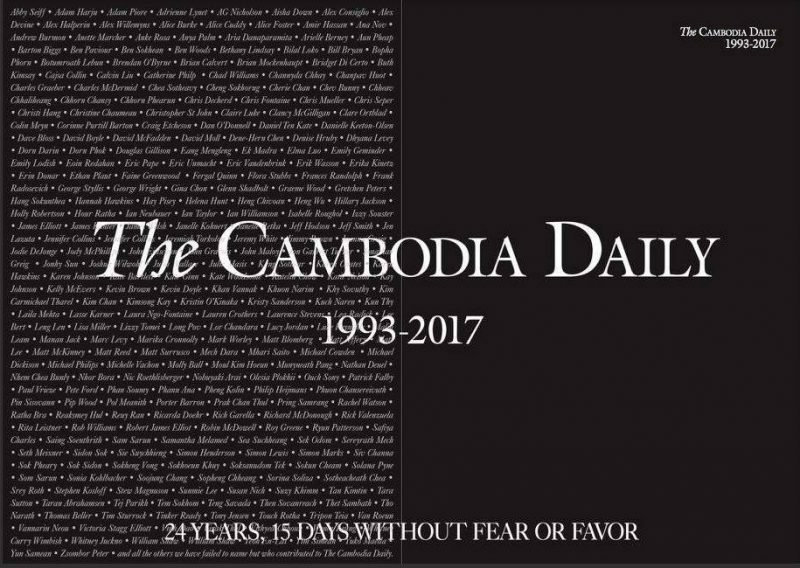 Cambodia Daily printed its last issue on September 4, 2017 after the government slapped it with a $6.3 million tax bill. The power to tax is the power to destroy. 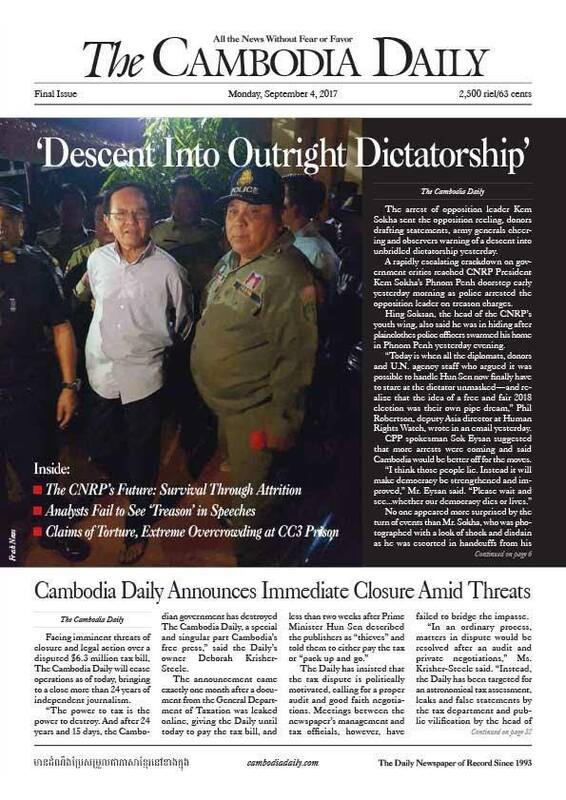 And after 24 years and 15 days, the Cambodian government has destroyed The Cambodia Daily, a special and singular part Cambodia’s free press. The Daily has been targeted for an astronomical tax assessment, leaks and false statements by the tax department and public vilification by the head of government. Cambodia Daily appealed for audit and negotiation with regard to the tax issue but the government refused to reconsider the case. Some think the tax department’s unwillingness to address the petition of Cambodia Daily reflected the stance of Prime Minister Hun Sen, who had earlier accused the people behind the hard-hitting paper of being “thieves” and “servants of foreigners”. We view these closures as part of a broader campaign to muzzle critical voices and to clamp down on freedom of expression ahead of the July 2018 national election. Media freedom is a fundamental component of any democracy, and it must be preserved in order for next year’s election to be free and fair. Cambodia's ruling party has been in power for three decades. It continues to dominate local politics but it lost many seats in the 2013 general elections. 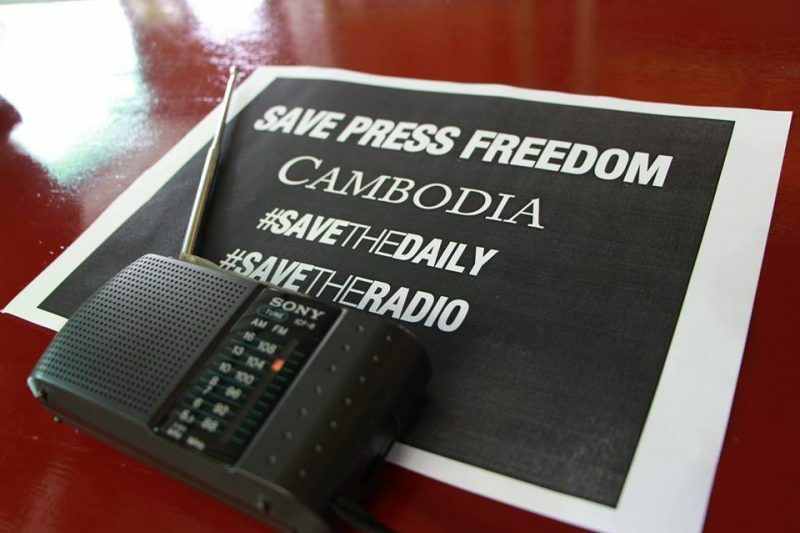 Aside from Cambodia Daily, radio stations that broadcast programs of the political opposition in 19 provinces have stopped operating due to alleged licensing violations. 2. Bernie Krisher, the publisher, never took a cent from Cambodia. He never profited from the country or its people. The alleged government crackdown on critical voices has not only targeted the media but also foreign NGOs and opposition leaders. The fact is that currently numerous newspapers, non-governmental organizations, and radio stations are in operation freely and harmoniously in Cambodia except a handful of them, why? Because the latter do not fulfill their duties in respecting the existing law and regulation of the host state. The Daily itself is speaking with political intentions to cover up that they don’t want to pay taxes. They wrote to the prime minister to help. This has nothing to do with prime minister – it is an issue with the department of taxation. The Daily, which for most of its 25 years operated as a non-profit NGO newsletter training local journalists, also never paid to use stories from news agencies like Reuters or Agence France Presse and in the past it never paid for the right to reprint stories from major newspapers in the United States. This free access to wire services and lifting rights from other papers was done under the guise of being a charity or NGO newsletter set up to train local journalists. Whatever the liability of Cambodia Daily, the paper was not given enough time to respond to the tax case and other violations it allegedly committed. …the Kingdom lost a significant aspect of its media diversity. It lost a training ground for a generation of Khmer journalists. It lost a beacon of free speech. It lost its most prolific chronicler of current affairs, a paper whose 24 years of daily editions will long serve as a first draft to modern Cambodian history.